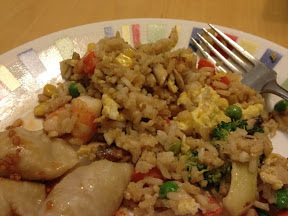 My hubby and I have been making fried rice ever since we first moved in together almost ten years ago. We both love going out for Chinese food, and, even before I learned to cook, we loved the team work of chopping millions of veggies and rapidly throwing them into a hot wok. We've tried countless recipes over the years, but could never capture that elusive Chinese restaurant flavor. No matter what we did, the dish was always lacking something. I followed recipes from Cooking Light and Cook's Illustrated, random Chinese cookbooks that my mom has had forever, experimenting with adding more soy sauce, trying oyster sauce, fish sauce, rice vinegar, sesame oil, hoisin, in different combinations and different amounts. It was never right. Tonight, I did it. And it is so simple. After browsing a bunch of recipes online, I was struck by how simple most of them were; nothing more complex than soy sauce, ginger, garlic, salt, and white pepper. I have only recently heard of white pepper, and had spontaneously picked some up when I was at Penzey's recently. Magic. That's what we've been missing. I made the rice with the steamed dumplings that KAF posted on the blog this morning. Steamed dumplings are another family favorite. These were easy and yummy: the outside was perfect, much better than the wonton-wrapper-covered ones I've tried before. The filling was okay, if a little bland; I'd like to doctor it a bit, maybe with some soy sauce. They were good with a dipping sauce, though (soy sauce, sesame oil, and garlic). The kids loved them; in fact, I think at final count, the little girl ate a dozen on her own. Most fried rice recipes I've found rely on simplicity, but we love it loaded with meat and veggies. Amounts here are approximate; I never measure too carefully when making fried rice; that's part of the fun, right? Have all ingredients prepped and ready beforehand. Cooking goes fast and you are constantly stirring. 1. Heat a wok over high heat until water sizzles and evaporates in a second or two. 2. Add 1 T peanut oil and swirl to coat. 3. Add chicken and cook until partly done. Add shrimp pieces and continue cooking, about 3 minutes, until both chicken and shrimp are cooked through. Remove to a large bowl. 4. Add 1 T oil to pan and swirl to coat. Add ginger and garlic and cook until fragrant, about 10 seconds. Add carrots and broccoli and cook for 1 or 2 minutes. Add mushrooms and cook for 1 minute. Add peas and corn and cook for 1 minute. Remove veggies into bowl with chicken and shrimp. 5. Add 1 T oil to pan and swirl. Add eggs and cook until just barely set, 1or 2 minutes. Remove to bowl. 6. Add 1 T oil to pan and swirl to coat. Add rice and stir. Add soy sauce, salt, and pepper and cook until rice seems warmed, 2 or 3 minutes. Add everything back in and give it a final stir.